See Chapter 8, Payments and Accounting, in the Users Reference Manual to see more about this topic. For stores with multiple divisions in the database, we have added the ability to set the division where the payment was taken in the payment screen. The program will remember what the combo is set to and use that division for the user until they change it again or log out. This field will be used in reports to know where the payment was taken. 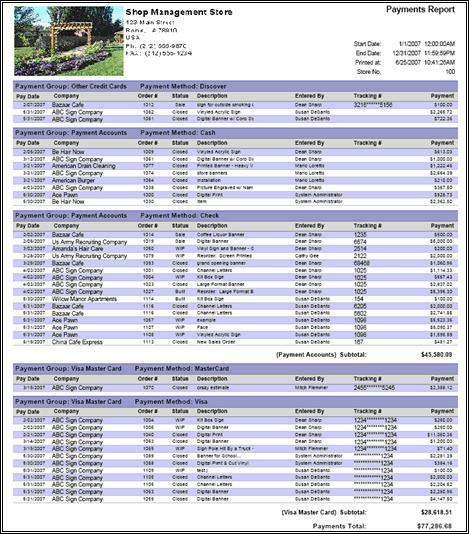 This report will show a breakdown of payments received for a chosen date range; information is grouped by payment type. Heading - Company information, such as logo, address, phone number, etc. Type of payment - What method of payment was used, credit card, check, etc. This will show a listing of processed credit card payments in a chosen date range, those that were successful and those that were declined, grouped by card type. Heading - Company information, such as logo, address, phone, etc. Payment Group - Credit card group, such as AmEx, MC/Visa, etc.